WAPAKONETA — The Auglaize County Historical Society will host an open house at the former Western Ohio Electric Railway (interurban) car barns, 1014 S. Blackhoof St., Wapakoneta, on Sunday, Sept. 9, from 1 to 4 p.m. The car barns are located behind the Auglaize County Engineer’s Office; signs will direct traffic and designate parking areas. The free event is being held in conjunction with Ohio Open Doors, which provides the opportunity to tour historic buildings and landmarks throughout the state in September. The Western Ohio Railway was organized at the turn of the 20th century, and began accepting passengers and freight in 1902. It connected Minster to St. Marys, and Celina to St. Marys to Wapakoneta. From Wapakoneta the route eventually went north to Toledo and Cleveland, and south to Dayton and Cincinnati. The electric railway was an important method of transportation for the rural and small town residents of Auglaize County, many of whom did not yet own automobiles. Small freight loads could also be shipped economically. 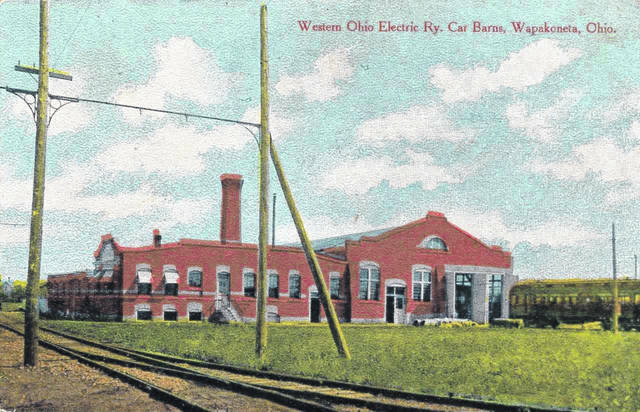 The car barns in Wapakoneta were constructed in 1903. With the advancements in automobiles and in roads themselves, the interurban system was doomed. The Western Ohio Railway ceased operations in January 1932. The car barns were later used by various entities, including the state highway department. The Historical Society extends its sincere thanks to County Engineer Doug Reinhart and his staff for this wonderful opportunity to see the buildings up close. Founded in 1963, the Auglaize County Historical Society collects, preserves, interprets, and shares the history of Auglaize County, enriching lives by connecting people and communities to the past and to each other. For more information about this event or the Auglaize County Historical Society, please contact auglaizecountyhistory@bright.net or 419-738-9328. The Auglaize County Historical Society is also on Facebook. Residents of Ohio are invited to discover Ohio’s amazing heritage Friday, Sept. 7, through Sunday, Sept. 16, as historic buildings and landmarks across the state open their doors for special tours and events during the statewide initiative. All Ohio Open Doors events are free. Most are special one-day-only opportunities. Visit https://www.ohiohistory.org/preserve/state-historic-preservation-office/open-doors-events-calendar to learn about other events. The Ohio History Connection’s State Historic Preservation Office administers the National Historic Preservation Act in Ohio. Many of the landmarks featured in Ohio Open Doors events are in the National Register of Historic Places, created by National Historic Preservation Act.